A trash picker that rescued Cosmic Monsters from the dump twenty years ago has set a world record in the game. Most people have probably forgotten about classic arcade clone Cosmic Monsters by now, which has worked to gamer Justin Baxter's advantage. He rescued a Cosmic cabinet from the scrapyard in 1990, and has been playing for years so he could reportedly set a world record. Baxter recently recorded a score of 145,680, beating out the supposed previous Cosmic Monsters world record score of 105,310. It only took Baxter at least 7 years of play. Hey, if you've got an arcade machine that barely anyone else has, why not go for the gold? "I knew I could beat it," Baxter said. "Over the last seven years I've honed a system. I always wondered what it would be like to tell people I'm a world record holder and now I can find out. I'm not sure how impressed they'll be though." SWNS reports that Baxter's score is a Guinness World Record, though Twin Galaxies, often considered the authority in videogame world records, doesn't list any scores for the "variation" at all. 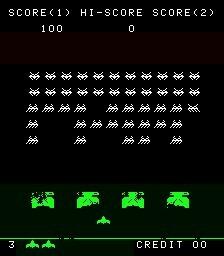 Meanwhile, the record scores for Space Invaders max out at around 55,000. Even if Baxter doesn't actually have a world record, he deserves some recognition just for playing a doomed arcade clone for so long. The hunt for the Cosmic Monsters world record doesn't quite have the pizazz of King of Kong, mostly because I don't think Baxter reached a kill screen, but he's still not done. Baxter says that he has plans to beat his own record, but if we're lucky, a sheen-haired rival will appear to give Baxter a run for his money.